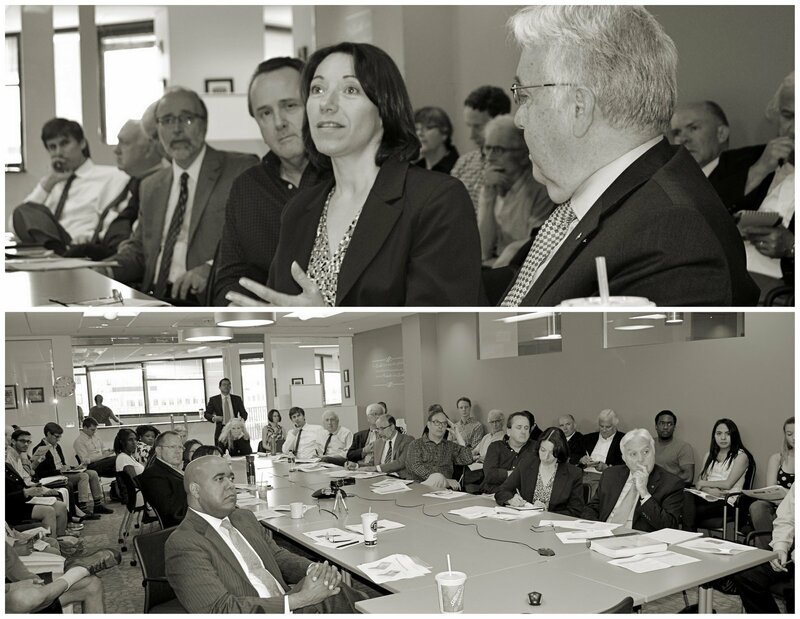 On May 20th, the DC Environmental Network, Global Green USA and Green Cross International hosted a special briefing on DC Water’s proposed modification to the long term control plan to reduce combined sewer overflows to the Anacostia River, Potomac River and Rock Creek. General Manager George Hawkins made a presentation on the proposed modification to the Long Term Control Plan that at some point will need approval by the courts. 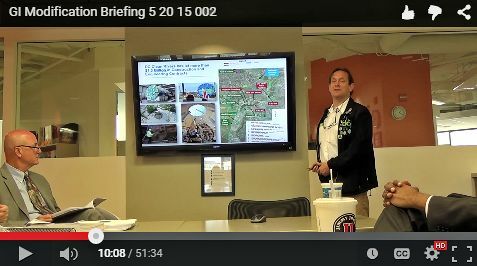 – Link to Video of DC Water presentation. – Link to PowerPoint of DC Water presentation. The briefing was attended by DC Water, DC Clean Rivers, Green Cross International, Earthjustice, Parks Conservancy, Natural Resources Defense Council, US EPA Region 3, US Department of Justice, University of the District of Columbia, Potomac River Network, IBC Engineering, Global Green USA, DC Appleseed, Nspiregreen, LLC, Federal City Council, LimnoTech, DC Smart Schools, Wentworth Green Strategies and DDOE (partial). – Comments of Earthjustice, American Canoe Association, Anacostia Watershed Society, DC Environmental Network, Friends of the Earth, Kingman Park Civic Association, Potomac Riverkeeper & Sierra Club. We are currently preparing new comments on the latest version. Thanks to Earthjustice, we have secured an extension to the public comment period on this proposal. Comments are now due on July 24th. You can access the Federal Register details on how to comment here. A DC DPW Director Who Understands Zero Waste? The DC Environmental Network (DCEN) found out last week that the Director of the DC Department of Public Works would be resigning after 11 years of service to the District. 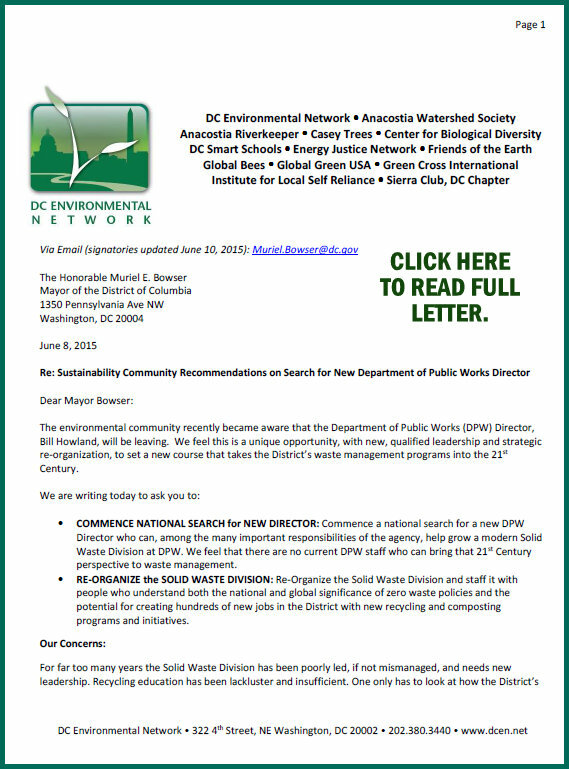 Earlier this week DCEN sent a letter to Mayor Bowser urging her to use this opportunity to find new leadership at the agency that can help promote zero waste principles and bring the District’s solid waste program into the 21st century. To read the letter to Mayor Bowser click here! DCEN was joined by Global Green USA, Institute for Local Self Reliance, Sierra Club – DC Chapter, Friends of the Earth, Center for Biological Diversity, Green Cross International, Casey Trees, Anacostia Watershed Society, Anacostia Riverkeeper, Energy Justice Network, Global Bees and DC Smart Schools. Look for more action by DCEN on this front.